Files on hard drive can be detected by their unique file signatures. Active@ UNDELETE can detect these files (see Supported File Signatures for exact list of file types) during Volume scan or Physical Disk Scan. In first case, scanning will be limited by volume boundaries when by scanning physical disk, you can specify custom boundaries of disk surface to scan. During volume of scan you have to select file signatures on scan dialog and they will be detected (if any) among other deleted or live files on selected volume(s) only. See Volume scan for more information. 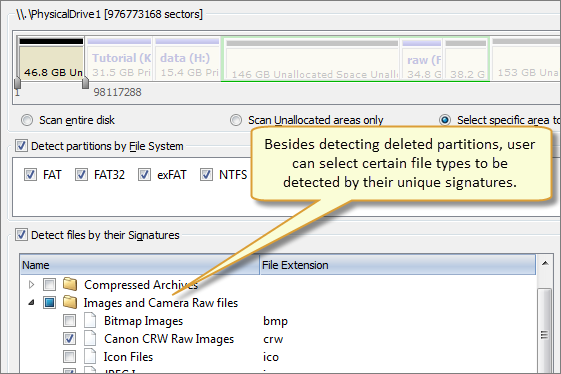 Files by signatures can be also detected during scan of disk surface not limited by volume boundaries. See Physical Disk Scan for more information. 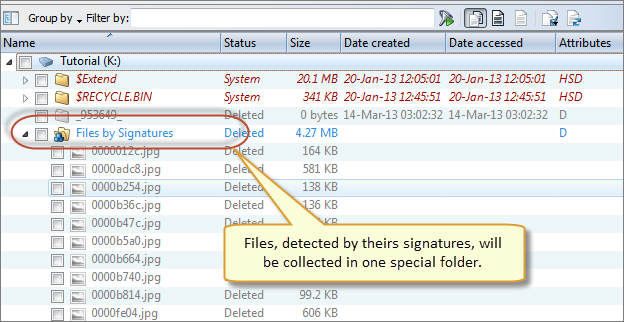 Detected files (if any) grouped in special virtual folder - Files by Signatures. Due to particular qualities of this algorithm, it is impossible to recover original file names, date and other attributes. 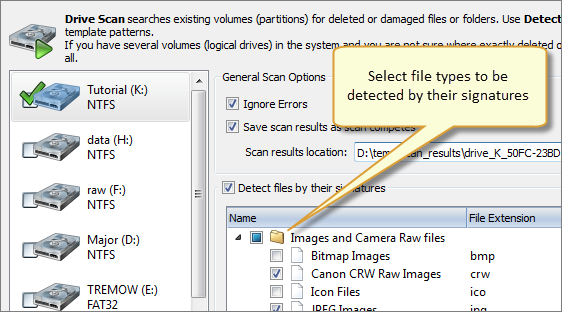 To evaluate integrity of some of the detected files you can use File Preview feature. Amount of selected files signatures directly impacts on total scan time.